With two minutes left in the third quarter in the jam-packed Glenville gym, the home crowd is getting restless, as visiting East Tech takes the air out of the ball. It's Dec. 9, and the East Tech guards are calmly playing keep-away well beyond the 3-point line, content with slowing down the fast-paced game to a standstill, killing the clock to make sure the trailing Tarblooders don't have a chance to touch the ball again this quarter. "Man, I knew East Tech was going to stall, they always stall!" one frustrated Glenville dad says in the stands, as a smattering of boos start trickling from the crowd with their team down by 8. "Foul him!" the parent yells down, pleading for someone to send East Tech to the free-throw line. But no: East Tech is still holding the ball as the crowd gets louder at each second that ticks off the clock. One minute. Thirty seconds. Fifteen seconds. Seven seconds. Finally, some action. East Tech senior guard Anthony Carmon puts the ball on the floor, uses a pick, drives left, cuts to the top of the key and lobs it to the right of the hoop in the path of charging sophomore guard Markell Johnson, who jumps and gently guides the ball in with a single smooth motion just before the third-quarter buzzer sounds (watch on Instagram). East Tech coach Brett Moore wildly pumps his arm with the kind of enthusiasm that can only come from knowing it couldn't have gone better. A collective groan from the home crowd lets out, recognizing that East Tech not only killed the final two minutes of the quarter, but ended it with a seemingly easy alley-oop dunk to boot. The fourth quarter gets no better for the Tarblooders. With Carmon and Johnson controlling the game, and senior Kory Cullum dominating the inside, East Tech hangs on to push their early record to 2-0 with a 5-point win. 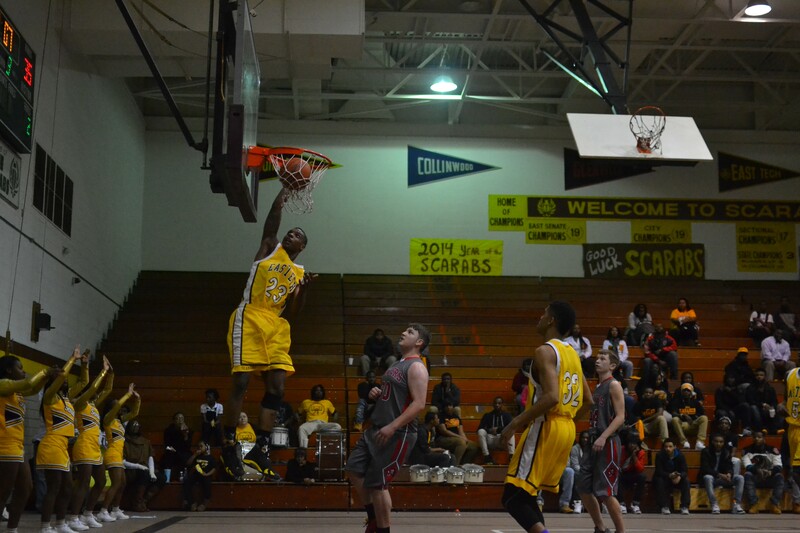 East Tech came into the 2014-2015 Senate League season with a target on its back. Last season, it became the first Cleveland public school in some 30 years to reach the high-school boys basketball "final four" down in Columbus. How do you follow up that kind of success? The answer's not easy for a program beset by scarce resources, a string of obstacles unheard of in well-funded suburban private schools, and an ever-changing roster created by Cleveland public schools' open enrollment policy. 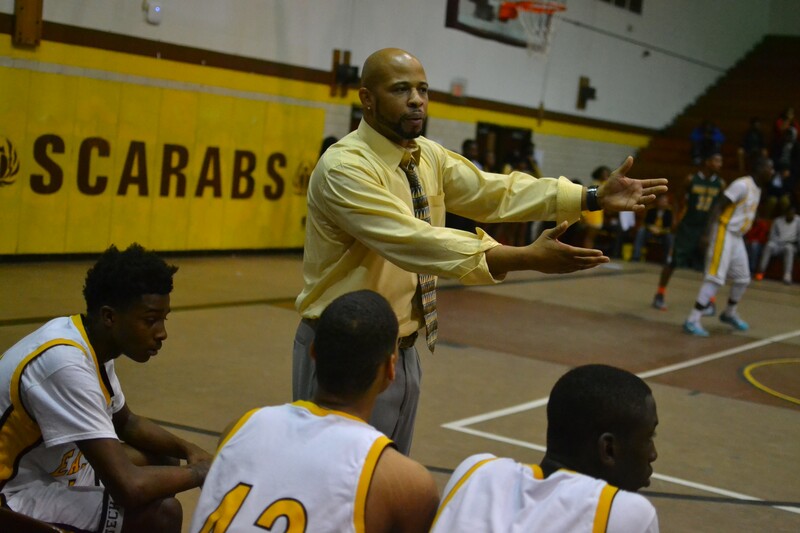 But East Tech coach Brett Moore isn't your typical public school basketball coach, and the talented trio at the center of the Scarabs — seniors Anthony Carmon and Kory Collum, and sophomore Markell Johnson, who's already drawing interest from the likes of Michigan State coach Tom Izzo — aren't your typical athletes. It's why East Tech not only has its eye on Columbus again this year, but also seems to possess the building blocks for a perennial powerhouse-in-the-making. The school on the corner of East 55th Street and Quincy Avenue has a long history of sports accomplishments. It is most famous, perhaps, as the high school where Jesse Owens first revealed the talent that would land him legendary fame and world-class accomplishments. Owens enrolled in 1930; during his senior year he tied the world record for the 100-yard dash and beat the world record in the 220-yard dash. In the 1936 Olympics in Berlin, he collected four gold medals under the gaze of Adolf Hitler. On the hardwood, East Tech has had plenty of accolades, though not for awhile before last season's success. The Scarabs have three state championships under their belt, with back-to-back titles in 1958 and 1959 that featured a 51-game winning streak, and another title in 1972. Cleveland's demographics radically shifted during those three decades and so too did East Tech's. After opening as one of the country's first trade schools in 1908, the school was mainly filled with the children of European immigrants. 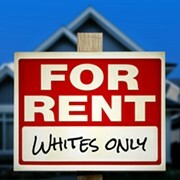 That gave way to a mostly African-American population by the 1950s. It remains that way today. 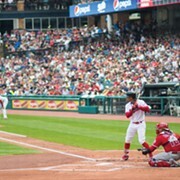 The 1972 state championship coincided with court-mandated busing aimed at desegregating Cleveland's schools, which dispersed the neighborhood talent pool across the city. "What broke everything up was the busing," says coach Brett Moore, 38. "Had busing never occurred, there would probably never have been any drop off because this neighborhood has been known for producing talent. I was one of the kids that should've went to East Tech." Moore grew up in the nearby Fairfax neighborhood but ended up attending West Tech and playing basketball in the mid-1990s. When he was in college — playing basketball and studying broadcast communication at Walsh University — Moore dreamed of becoming a cameraman for TNT, traveling around the country filming NBA games. That all changed his final year at the school. His playing eligibility all used up, his coach made him an offer too good to pass up: He'd keep him on scholarship if he helped out with the team. "I fell in love with being on the sideline," he recalls. "I could see myself doing this; that changed the course of everything, so when I came out of college, I became a substitute teacher and started coaching at the rec, and all I taught them was stuff I knew from college." After landing a substitute teaching job at East Tech, Moore was also coaching teams of 12-to-14-year-olds and 15-to-17-year-olds at Zelma Watson George Recreation Center on Cleveland's east side in the early 2000s. Moore recalls the time Walt Killian, an East Tech player in the 1960s and longtime coach at Shaw High School, approached him after watching Moore's Saturday rec league teams play. "He said we had to be the most organized rec league team he'd ever seen in his life, like 'I've never seen a rec team run plays like that,'" Moore recalls. "We were just destroying people." In 2003, Moore made the first jump in his coaching career, as it were, volunteering at Collinwood High School after one of his players mentioned the school could use some help. "I talked to coach (Ken) Vana only because in four years of high school, we never beat Collinwood. They never had more talent than we did, but they always beat us. What does this dude know?" says Moore. "So I went over there and he said I could help out, volunteer, and I did just to watch this guy work. I picked up so much. Collinwood was the most disciplined public school at the time, so they always gave themselves a chance to win, and they always did their share of winning. The only thing holding them back was they didn't have the most talent." It wasn't long before Vana saw Moore's potential to take another step. "I was bringing coach Vana these scouting reports and they'd be so detailed with player breakdowns, tendencies," says Moore. "So he was like, 'Man, it's time for you to get your own job.'" Moore thought, "Why not East Tech?" He had been a long-term sub there, and they could obviously use some help. "When I was at Collinwood, we beat East Tech by 40," says Moore. "They had talent. I'd watch these kids play, and there's no way in hell we should've beaten them by 40." In 2005, the East Tech varsity job opened up. East Tech assistant football coach Shawn Williams volunteered for it and brought Moore on as the JV coach, getting his foot in the door with the promise that as soon as he got a head football coaching job, he'd hand the basketball program over to Moore. They didn't realize that chance would come the next year. 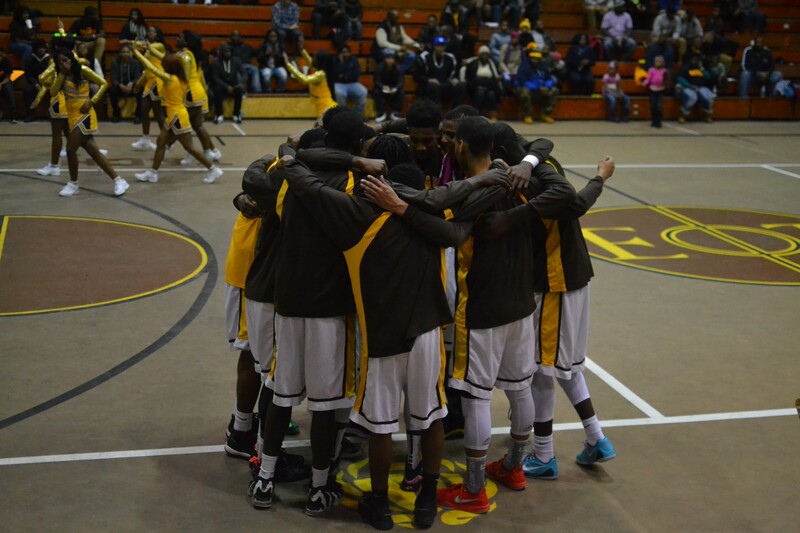 East Tech won just a handful of games every year, including just four before Moore arrived. In his first season as head coach, 2006-2007, they lost only four, taking 17 games and the city championship. In eight seasons, the Moore-led Scarabs have had nothing but winning seasons, including 16-, 17-, and 24-win seasons in the past three years. Last year's amazing run included an undefeated city run, a district championship over defending champions Mentor, and a regional overtime win against Uniontown Lake. The improvement would be startling for any program, let alone one facing the problems that plague East Tech. For starters, there's the staff. It's Moore and JV coach Daryl Forrest, a gym and health teacher at the school. That's it. No assistants (except for volunteer Phil Cullum), no athletic trainers. Then there's the gym. East Tech's "new" home was built in 1972, and by the looks of it, it hasn't been updated since. Rickety wooden bleachers surround the court, and the dim lighting is just bright enough to bring every scuff and scrape into clear view on the synthetic tartan playing surface. "It's like playing on concrete," Moore jokes. 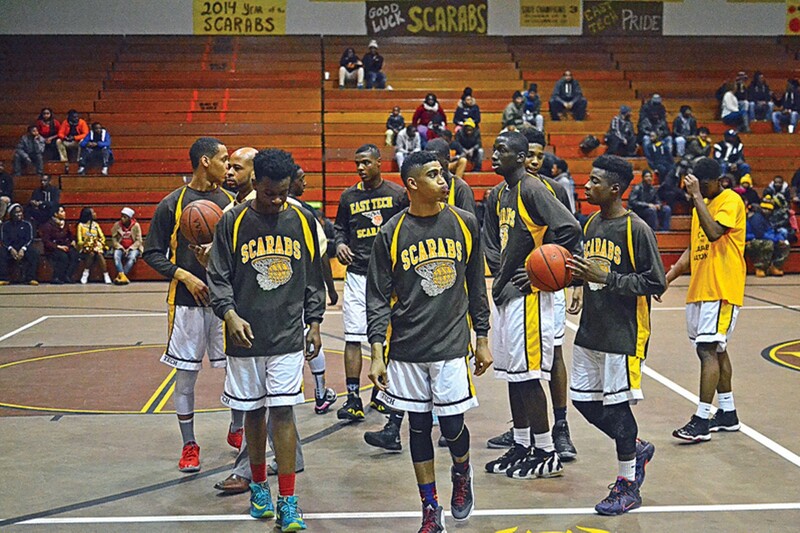 The court is among the reasons why the Scarabs have so few home games: Opposing teams just don't want to play there if they don't have to, which this year means only six home games for the squad. Then there's the practice time. Gym time is split between four teams (boys and girls varsity and JV). Cleveland's custodial contract means there's no money to pay overtime to keep the gym open long enough for each team to practice. The two dozen boys on the JV and varsity teams, for example, often alternate with the girls' teams at the school's gym and the nearby Friendly Inn development center's court. And then there's enrollment. In 2010, East Tech was bumped up to Division I in the Ohio High School Athletic Association, meaning a school with more than 369 students. East High and South High were closing that year, and administrators thought the move would bring an influx of kids into East Tech, pushing the numbers to Division I status. But that influx never really happened. "And we've never come back down [to Division II]," says Moore. The entire third floor of the school is vacant. And, finally, there's Cleveland public schools' open enrollment policy. Essentially, it means any public school can take any student who wants to go there, even if they live outside the school's normal geographical boundaries. It means never being sure from one year to the next what the roster might look like, or which nearby middle-schoolers will be coming in. Last year's trek to the state semifinals accelerated that shuffle, with a number of kids making the jump to East Tech to fill the void, including transfers from Glenville, John Hay and a senior who moved from Vegas to Cleveland over the summer. The JV squad has a promising player who lives in Strongsville: His father, a former East Tech player, wanted him to go there. "This is the first time we've had so much change," Moore says, "I like to grow my kids through the program. Last year I lost eight guys, so there were still a lot of voids." Going forward, Moore says he won't keep seniors who transfer to the team after this year unless they're guaranteed starters: If they don't already have the basketball knowledge and mentality needed to make it, there's not enough time for Moore to bring it out of them. Find another state powerhouse with that line-up of challenges. And find one that overcame them, then went on last year to topple defending state champ Mentor (Ohio's third largest school, with more than six times the enrollment of East Tech), along with highly touted Shaker Heights and Uniontown Lake, before eventually losing to state champions St. Edwards. "It's the pride and joy of the neighborhood," Moore said this summer of his team's run. "A lot of the alums from the 1950s through the 1970s were just telling me they never thought they'd see East Tech go down to Columbus again. And even though we came up short, it was still a win for the neighborhood. It was a win. People never thought we'd see the Ohio State court with our name on it ever again." Moore lost eight seniors from that team, another hurdle. His 2014 squad would be filled with three first-year upperclassmen transfers (Cantrel Woodley, Jayvonte Thomas, Dominique Rodgers), three call-ups from last year's JV team (Johnny Pullum, Damarious Green and Carl Bigsby), a freshman contributor (Tyshawn Howard) and a freshman and a sophomore rotating between varsity and JV. But Moore had three returning players. And they can ball. 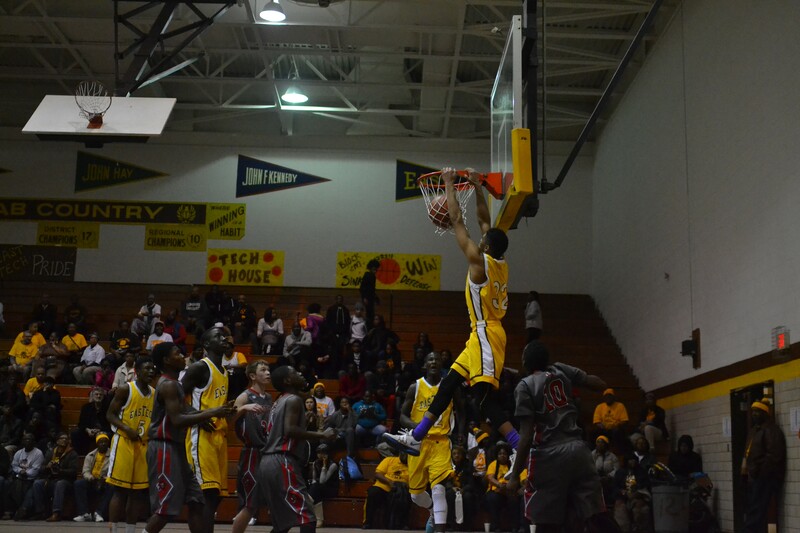 Senior Kory Cullum is the only Scarab to play four years at East Tech, and three with varsity. He's a 6-foot-5 freak of an athlete who regularly dominates the smaller and less skilled big men who square off against him in the paint, despite the fact that football, not basketball, is his one true love. He's eying a football scholarship to play receiver at Howard University, should his ACT scores work out. For now, he runs the interior of the Senate League with athleticism and coordination his opponents can't match, flashing ball-handling skills and a soft mid-range jumper. He's averaging 20 points, 11 rebounds, and 3 steals a game when he plays — pretty much all you could ask of a big man's output. "I wanted to play with my cousin," Carmon says. "It was either here or Central Catholic, so I came over here mainly to play with my cousin, and then I found out Brett was a really, really good coach who could make me into a top D-I player, and that's what I am now."